Portabella Pizzas was posted on October 2nd, 2014 and is filed under Gluten Free, Low Carb, Main Dishes, Recipes. This entry has 4 comments. You can follow any responses through the RSS 2.0 Comment Feed. This recipe is for my fellow “hobbit” friends. And when I say hobbit, I don’t imply that I’m short and only think short people should eat this. Or that you have hairy feet. 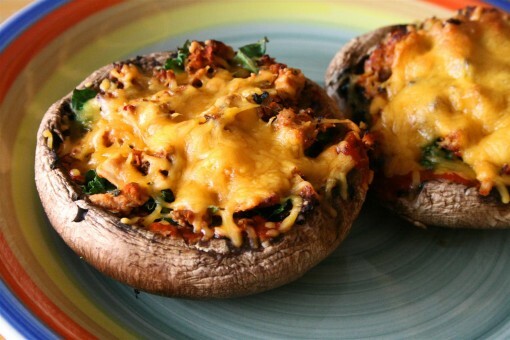 These mini pizzas feature the most esteemed Portabella mushroom…and hobbits love mushrooms. It’s a great way to stack up your veggie intake and get in more B vitamins and minerals into your day. Plus, one mushroom cap is like 35 calories! Serves 2. Take the stems out of the mushrooms and gently scrape some of the inside of the mushroom out…so you have room to load your “pizza shell” with goodness. Top with light pesto and tomato sauce, load with whatever veggies you like…protein and cheese…you get the idea. Bake for about 10-12 minutes at 450 degrees. This recipe is a basic framework, but essentially you can do whatever you like. Vegetarian? Skip the meat? Vegan? Use a dairy-free cheese. 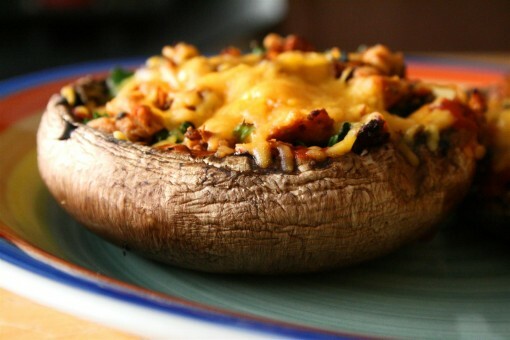 Tried Portabella mushrooms before? What do you use them for? Soo love this idea! Way to have fewer calories and lots of healthy goodness! Those look amazing. I have to try this! Though I’m still not convinced they will ever replace my love of pizza.